The RV Doctor: RV Holding Tank Evacuations Optimized! RV Holding Tank Evacuations Optimized! Pam, in order to practice optimum waste management, it is always best to keep both holding tank valves fully closed until the tanks are as full as possible. Most experts recommend at least 3/4 full. If you do not fill it to that level during the course of a weekend, it’s still best to fill them with fresh water to at least the 3/4 mark (completely full is best), before evacuating. There’s a couple of reasons for this. The fuller the tank, the more velocity you’ll have during the evacuation which helps to completely flush all the contents; especially for the solid waste tank. Plus it gives the through-the-wall monitor probes a better chance of staying cleaner. The sludge/tissue/residue on the sides of the tank are less likely to dry out and become rigidly stuck when you fill each tank almost full prior to evacuating. 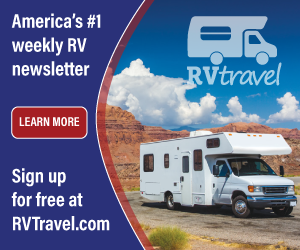 Another reason for closing the valves, specifically the liquid tank valve, is to avoid your RV becoming a virtual vent for the septic system of the campground itself. See my explanation under number 3 below. 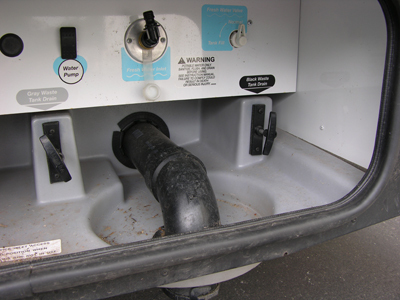 If you happen to have an internal venting problem or dried out P-traps within your RV, odors can further proliferate. Here’s a proper dumping procedure that was recently featured in an article I wrote for FMC Magazine. 1. Always wear disposable protective gloves when handling any waste system component and be sure to wash your hands thoroughly afterward. 2. Connect the sewer hose. Begin by inserting the nozzle end of the hose into the campground sewer inlet or dump site, and open the valve on the nozzle. Walk back towards the termination assembly on the coach extending the hose only the distance required. Always avoid snaking a full-length hose back and forth on the ground. If more hose is needed to reach the coach, simply attach an extension hose when necessary. All quality hose makers will have extension hoses and connectors. To complete the connection, remove the protective cap or plug on the motorhome end and attach it to the termination outlet. Be sure to maintain the proper slope of the drain hose from the termination outlet to the sewer inlet. Known as the “first in - last out” rule, inserting the sewer end first and removing it last will guarantee no release of waster water and avoid further contamination on the ground. Note: this is only applicable if the hose has a positive shut-off valve on the sewer end and a cap or plug on the coach end. 3. Only evacuate a holding tank (black or gray) when it is over 3/4 full. Yes, contrary to what some veteran RVers may tell you, this means leaving the gray valve fully closed while in the campground. Filling each tank to a level above the 3/4 mark before evacuating will ensure you’ll have enough volume (and velocity), to thoroughly drain the tank and flush the hose. Here’s another reason for keeping the gray holding tank valve completely closed except during evacuation. Ever walk through a beautiful, scenic campground and catch a whiff of sewer odor wafting through the park? Kinda ruins the moment, right? All coaches with the gray tank valve in the open position (sewer hoses obviously connected), are simply acting as a direct conduit to the park’s sewer system. Each coach becomes a mini-vent of sorts, in parallel with the septic system of that campground. No wonder sewer odors still abound in the nicest of destination sites. 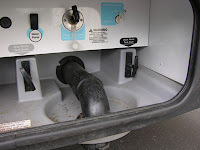 Follow the logic; a large septic system in a campground will have fundamental venting designed into it, but with numerous RVs connected to that system with their gray tank valves open, odors can rise up through the park’s septic system, through the sewer hoses of those coaches, through their empty gray holding tanks and up the vents of those holding tanks. Remember, it may be your gray tank, but it’s the campground’s black and gray odors coming up and through it. The only problem with this scenario is that the gray tank vents on the RVs are a lot closer to the ground and more prominently located than the park sewer stack so odors are more noticeable. By keeping the gray tank valve closed until the tank is almost full, you will eliminate the localized venting of the campground sewer gasses at your particular site. The more RVers who follow this precept, the less likely we’ll have to endure septic odors in and around the campsite. 4. Evacuate the black tank first. This is pretty much standard procedure and something most all coach owners are aware of, but it’s worthy to mention it again. After the black tank empties flush it out with a large amount of fresh water when connected to city water. Simply keep flushing the toilet while the termination valve remains open. If you opt for the Polychute or Drainmaster hose, monitor the cleanliness of the water through the integral Clear-Vu fitting as it drains. There are other clear fittings available for the bayonet-type hose adapters as well. When the draining water is relatively clear, stop flushing, close the gate valve and cover the bottom of the black tank completely with fresh water. Permanently installed holding tank spray kits are available in the aftermarket that attach to each holding tank thereby allowing fresh water to be directly induced into the tank after dumping, but I’m hesitant to drill mounting holes into holding tanks. Plus I like to flush all components of the waste system including the toilet, sink drains, etc., so I prefer to simply flush the toilet and run water through the sinks. 5. Evacuate the gray tank last. After the black tank has completely emptied and its termination valve properly closed, open the gray tank valve and empty that holding tank. Be sure to rinse this tank as well. Dumping the gray tank last utilizes its liquid contents, as well as the fresh water induced after dumping, to help wash away any solid waste that may remain in the sewer hose. 6. Drain the sewer hose. After both tanks have been emptied for the last time at that location, take the time to thoroughly rinse the sewer hose with fresh water until clear water is viewed through the Clear-Vu fitting on the sewer hose. After closing the gray termination valve, remove the sewer hose from the termination outlet on the motorhome and, if so equipped, secure the plug to the hose and the termination outlet. Then begin “milking the hose.” In other words, raise the hose at the coach end and walk it towards the sewer inlet. Keep raising the hose as you walk, thereby “milking” the hose and emptying it completely of water. Even a properly sloped flexible sewer hose may have residual water and waste particles left inside. These particles will become an odor generator over time, so it is imperative to completely remove as much moisture as possible. 7. After milking the hose and as you reach the campground sewer inlet connection, close the positive shut-off valve on the sewer nozzle and disconnect it from the campground sewer inlet. Remember the “first in - last out” rule! With the cap on the coach end and the nozzle valve turned off on the sewer end, all remaining odors stay inside the hose. Cap the sewer inlet and then stow the hose and add an enzyme-based additive to all holding tanks. 8. Check the P-traps. Unless you upgrade to HepvO waterless sanitary valves, every month or so, look down each sink drain and the tub/shower drain to ensure the water seal is still there. In some waste system configurations, a quickly draining tank can actually cause the water lock to be siphoned out of the trap. You’ll probably have to use a flashlight, but it is essential that a water lock remain at all times. Remember, this is the primary method of preventing gray holding tank odors from entering the interior of the coach. Bottom line; a dry P-trap is nothing more than a shortcut for odors to gain entry into the motorhome. 9. Be sure the toilet bowl contains water at all times. If water eventually seeps past the seal and the toilet bowl empties, it’s time to make an appointment at your local service center. An empty toilet bowl will permit black tank odors into the coach. If water can leak past the seal, odors can also!